This conical mountain is located about midway between Chūson-ji and Mōtsū-ji temples. 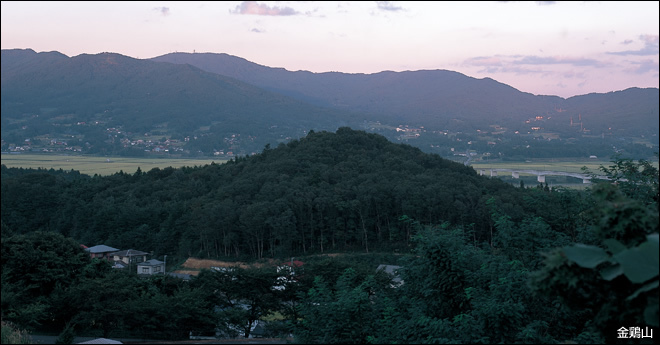 There is a sutra burial mound on the top of the mountain. There are also legends that a golden statue of a cockerel is buried here to protect Hiraizumi, and that the top of the mountain was raised in one night, with labourers lined up all the way from the Kitakami River. The haiku poet Matsuo Bashō wrote in his travelogue, 'The Narrow Road to the Deep North', "I came upon Lord Hidehira's mansion, which had been utterly reduced to rice-paddies. Mount Kinkeisan alone retained its original shape." Copyright (C) HIRAIZUMI Tourism Association. All Rights Reserved.